yesterday i went to the bookstore for a class thing. i ended up in the education/parenting section looking up dyslexia when i happened across this book. i finished it last night. it was a really quick read, especially after i gave up on reading the lengthy dreams she recounted throughout the book that i guess coincided with the story, but dude. really neat story. and true! 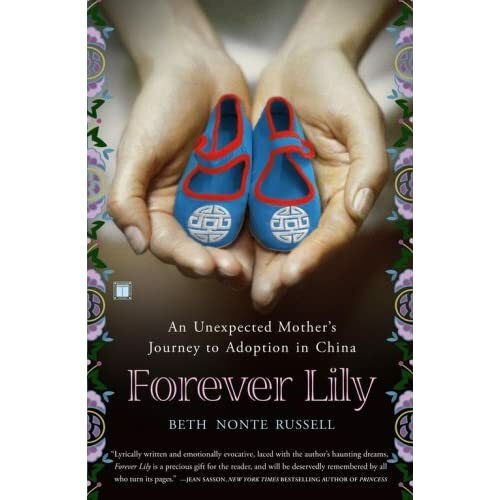 basically, this chick, beth russell, goes with her friend alex to china because alex has to finalize the adoption of a little chinese girl. after the adoption is basically complete, alex freaks out and says she can't do it; she doesn't want to take this baby home. by this time, russell is enamored of the "spindly" little baby and has seen the baby come around wonderfully with just a few days of love and care (and food!) and thinks that there is NO WAY they can send her back to the orphanage. a trip to the orphanage cements this resolution. it is so cold there. there is just one caretaker to per 40 or so babies, and the babies are all placed in cribs, alone, or high-chair type seats where they are immobile for the day. only 1/3rd of the babies get adopted out... the folks at the orphange are not comfortable saying how many survive. those who do survive to adulthood get "trained for occupations"... russell fears that many of these young girls end up as prostitutes. so what she decides to do is... adopt the baby herself. !!! this lady who has no children, who decided she did not want children, was so in love with this baby after two days, that she decided she wanted to adopt her. and her husband agreed to it, without her even asking. you know i cook now?